This ad is a well-known local landmark, and has been mentioned previously on this site. Back in 1977 when this photo was taken it was in a more natural and somewhat faded state, rudely interrupted by an ad for AGA cookers. Recently there’s been a call to repaint it (again). There’s some debate about whether repainting these signs is always appropriate. They’re often called ‘ghost signs’, hinting at the fact that they’re advertising products or services no longer available, or perhaps organisations or businesses gone from those premises (like the sign for Olivers, on Micklegate). They are perhaps more evocative of times past, lost products, when they’re faded and understated? The carefully restored signs on the old Stubbs ironmongers on Fossgate look a bit odd repainted so neat and bright, particularly now the building houses a fish restaurant instead. 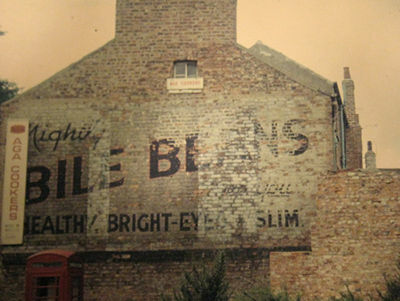 Of course the famous Bile Beans sign has already been restored once anyway, and perhaps if it hadn’t been repainted in the 1980s it wouldn’t be visible to us now. Maybe I prefer it faded, but I guess we’ll carry on repainting it every few decades, and continue to amuse visitors with this proud proclamation of a strange-sounding long-forgotten product. An earlier page on this site: Painted wall ads, from 2007 (page title chosen when I wasn’t familiar with the term ‘ghost signs’). Thanks for mentioning my site, I love the 1970s photo and it’s the first I’ve seen of the sign before the 1980s restoration. I look forward to seeing more about the current restoration effort. I’m really pleased to see that I helped to spark off large number of Bile Beans -related posts here. I think I might be in the ‘leave it to decay’ camp – the new one looks so garish.